Slashdot gave some light to this story about three months ago and I thought it was a good idea. It is called undervolting and it works. My sis has this big dumb Dell 9300 with the Pentium M 1.73Ghz. It is a great little processor. The standard voltages were .988v @ 800mhz and 1.35v @1.73Ghz. At 800mhz it would hover around 50 degrees Celsius and 1.7 would be about 85 degrees Celsius. Or way hotter than anything this expensive should run. The fans would run full speed at idle and the keyboard would nearly melt flesh at maximum speed. After messing around I have gotten the minimum voltage to .700v @800mhz (Stable) and I am still working on the higher voltage, however it is 1.180v @ 1.73Ghz and I can still go lower. Temps dropped too; down to 35.5 degrees Celsius and 65.5 degrees Celsius while running Prime 95. All the tools you need are listed on the first article and work. 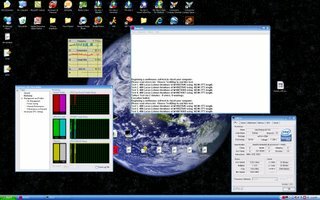 Undervolting does not work on desktops or celeron bases notebooks. :( If this works like I think it will. She should get 25-20% better battery life and 30% less heat from this beast. The fans are soooooo quiet it amazes me. Update: I'm at 1.132v @1.73Ghz and have a stable temp of 55.5 degrees. A 29.5 degree difference. WHOO!!! Update 2: 1.73Ghz @ 1.100v = 50 degree Celsius. 100% throttle and 85% load. Update 3: 1.73Ghz @ 1.100v = 57.5 degrees after 6 hours of Prime 95. No warnings no errors. The battery would last about 75 minutes before and I have been using Firefox, Media player, Prime 95, and full monitor brightness for over an hour and a half.